Veterinary Imaging Center of San Diego (VICSD) stands at the forefront of veterinary radiology practice and research nationwide, specializing in Veterinary Ultrasound, CT, MRI, Nuclear Medicine, Feline I-131 (Radioiodine) Therapy, Veterinary Teleradiology and Interventional Radiology. VICSD is a referral-based clinic that serves all of San Diego County, working as an outpatient imaging specialty center and an extension of the general practice veterinarian’s hospital. 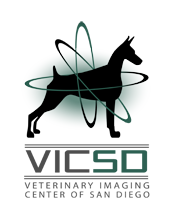 To learn more about what veterinary radiology has to offer, please visit our services page, take a virtual tour of our radiology center, or call us to request some of our diagnostic imaging brochures. We also offer Mobile Ultrasound service and are available by phone on Saturdays!